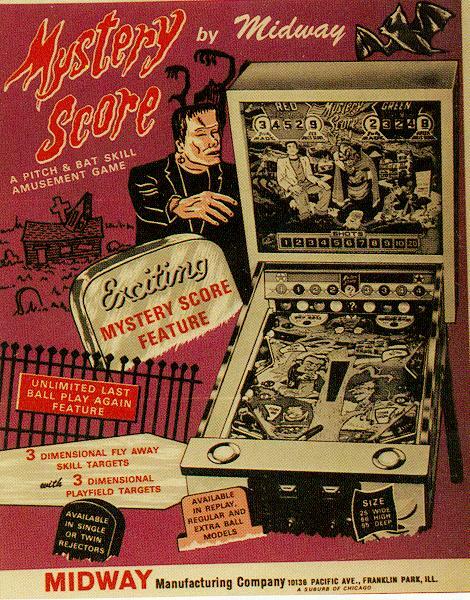 Description: Mystery Score, Midway, 8/65, one player, monster theme pitch and bat. 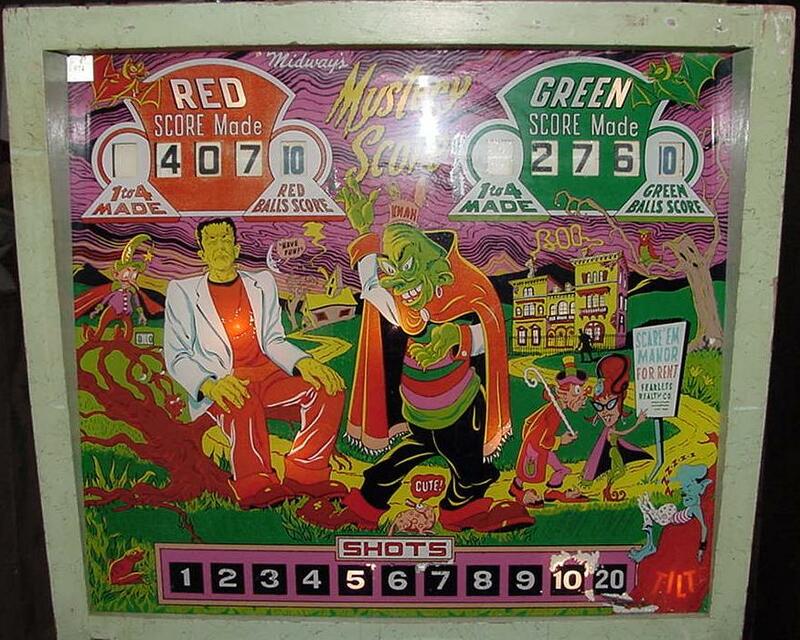 Though the game has two sets of score reels, it is a single player game. Separate score for green and red targets (i.e. hitting a red target scores points for the red score reel, etc.) All targets are three dimensional (essentially round balls cut in half). Rear targets, as hit, swing upward and out of the way. A target motor can then reset them back down. Unique motorized score reels (a traditional coil/plunger is not used to advance the score reels). A total of four motors in the game (feature, pitch, target and score-reel motors). Uses 7/8" balls and a 23" x 37" x 3/16" tempered playfield glass. 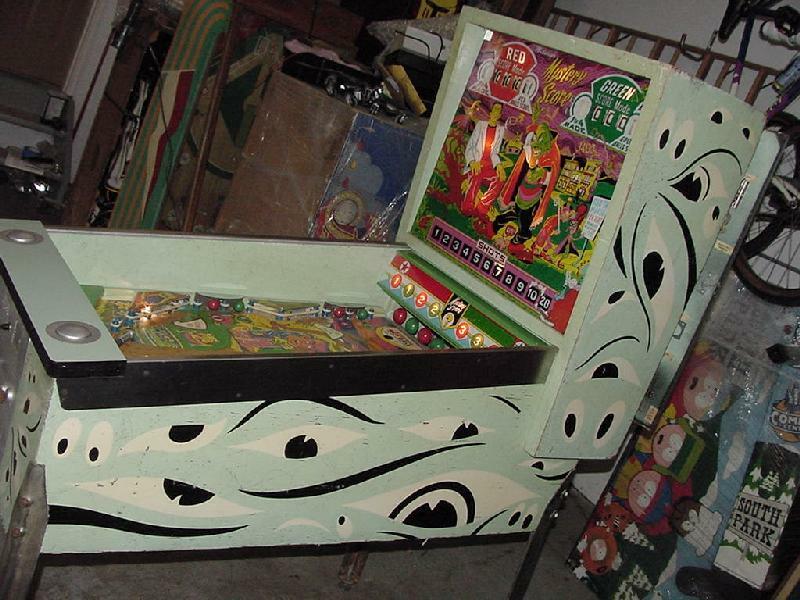 Other than the rear red/green targets, there are also red/green playfield slingshots and standup targets. 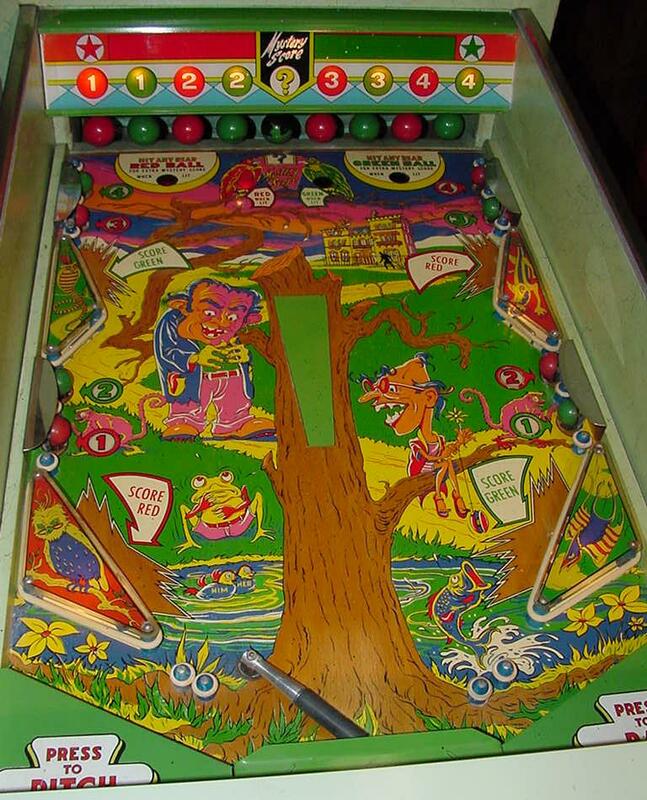 There is also two score reels for number of red/green balls scored across the back of the playfield (from one to ten balls). On a single pitch (ball), the player can score points for both the red and green. 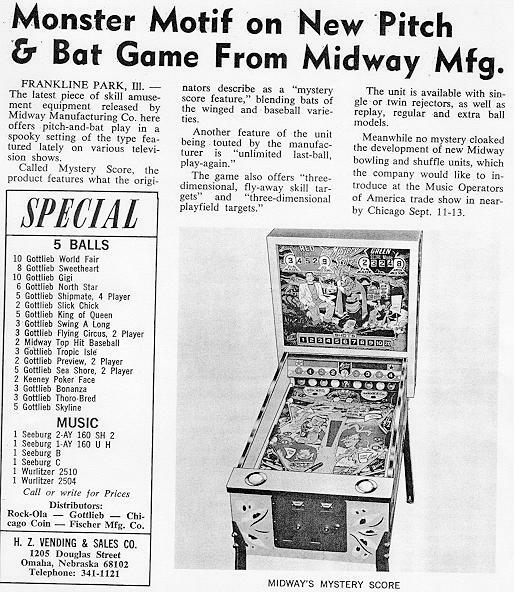 Ten balls pitched per games, with extra balls awarded at end of game if player keeps hitting the designated colored rear playfield target. A game could go on forever if the player keeps hitting the designated rear color target. Bat also works at any time (much like an impluse flipper), so a single ball can be batted multiple times. The way a ball is scored is somewhat unusual. 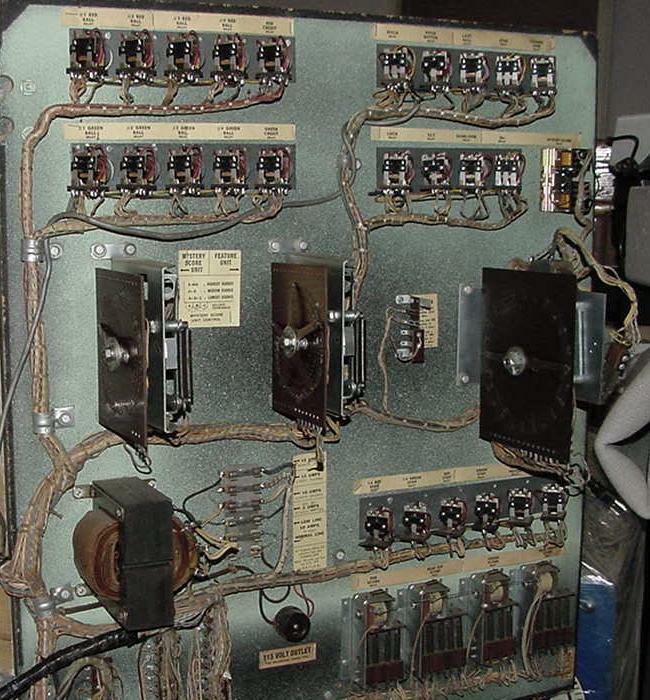 All the score reels are motorized (like pretty much any Midway game 1965 and later) by a single motor. There are clutches (relays) on each score dial that allow it to turn and score. When a ball is pitched, the score reel motor turns on and stays on until the current ball drains. Since the game allows multiple bats on a single ball and there are slingshot kickers, the score reel motor can stay on for some time while the ball is batted around. When scoring is needed the relay pulls in for that score dial and allows the score reel to turned by the motor. 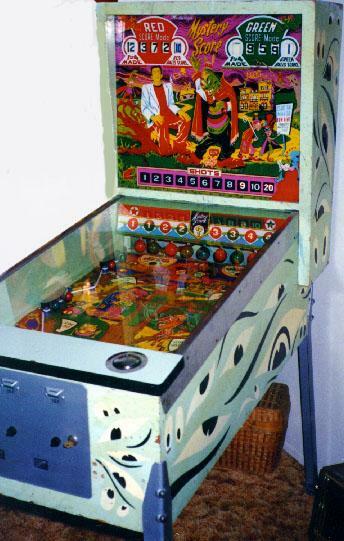 All the ball drain areas have a switch which opens when the ball drain, which turns off the score reel motor. Click here for a 925k MPG 160x120 movie (10 seconds) of Mystery Score being played.